Kenyans are losing patience with their ill-equipped and notoriously corrupt police force. 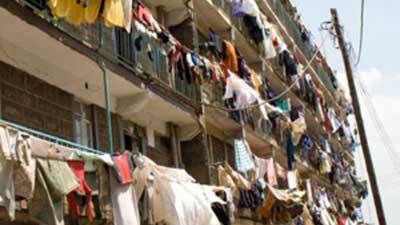 Poorly paid police officers and their families often have to share cramped and dilapidated quarters in Nairobi. Their capital tarred with the nickname “Nairobbery” and under almost constant threat of attack by Islamist militants, Kenyans are losing patience with the ill-equipped and notoriously corrupt police force. A catalog of security failures has exposed the inability of Nairobi’s underpaid police to deal with the severe security problems, prompting President Uhuru Kenyatta to step in and promise a massive overhaul. But analysts and security experts say it will be an uphill struggle to undo the broken relationship between public and police, given the ingrained stigma attached to the job and the fact that Kenyans have resorted to mob justice or now-ubiquitous private security firms. “The public in Kenya has never really trusted the police, hence the failure of such noble concepts as community policing,” said Ken Ouko, a sociology professor at the University of Nairobi. Joining the police has always been viewed as a career choice of last resort akin to an admission of academic failure, Ouko said. “Most policemen carry with them an anger that quietly seethes underneath as they go about their daily operations,” he added. The result is plain to see: anti-corruption website, ipaidabribe.or.ke, provides daily accounts of police extortion, mainly involving motorists stopped for spurious traffic violations and told to pay up or go to jail. On social media, police are held in almost constant contempt. There was particularly vehement ridicule in January when police downplayed an explosion at Nairobi airport, saying it was an exploding light bulb, only later to arrest four Somalis and charge them with a terrorist attack. Outside of Nairobi, the picture is no better. Police in western Kenya are still embroiled in a scandal after a group of alleged gang rapists were ordered to cut the grass at a police station as punishment. And there are frequent reports of mobs lynching alleged thieves for crimes as petty as stealing a chicken. Police salaries contribute to the low esteem and lack of motivation: the lowest ranking Kenyan police officers are currently paid $200 a month, way below the average cost of renting a small Nairobi apartment. Officers and their families often have to share cramped and dilapidated quarters, sometimes with only a thin partition or curtain separating them from the next family. This is seen as a major factor driving the alarming number of burglaries and armed robberies in which the police are implicated. The lack of trust and security is clear across Nairobi’s changing cityscape, dominated by residential compounds with high walls, razor wire and bars on windows. Police have also drawn ire for rounding up thousands of ethnic Somalis in indiscriminate counter-terrorism raids. In a state of the nation address to Parliament last month, Kenyatta admitted an “unacceptable lack of coordination in our handling of crime”, and said “public frustration and anger” over bad policing had “occasionally boiled over into mob injustice”. The president vowed to put more officers on the streets and pay give them better salaries, housing and health insurance. He said the government would also provide the force—whose officers have been known to beg for a lift if called to a crime scene—with more sophisticated surveillance equipment and 1 200 new vehicles. But Peter Kiama, director of the Nairobi-based rights group Independent Medico Legal Unit, says the problem runs far deeper than low salaries and poor equipment. “While I fully support the need to invest in police capacity and welfare, I do believe that incentives may not matter at all as long as the mindset of the officers does not change,” said Kiama, whose organization monitors police brutality and torture. He said his organization has documented 48 deaths at the hands of the police between January and March this year. Some police, particularly the anti-terrorism unit, have come under fire for alleged abuses including torture, arbitrary detentions and disappearances, particularly against Muslims suspected of being militants. Western diplomats have also voiced frustration over the lack of police capacity in a region subject to complex terrorist threats from al-Qaeda sympathizers in East Africa and the Horn of Africa. “Most policemen would sooner take a bribe than stop a terrorist attack, and there are others who are happy to bump people off and feed them to the hyenas,” said a European law enforcement expert, who asked not to be named. A senior Kenyan police detective admitted the situation was dire and that years of neglect had left the force out of sync with the changing security situation—whether in terms of small arms proliferation or last year’s siege of the Westgate shopping mall.